About 4,000 of the 11,000 American and Filipino prisoners of war from Corregidor were marched through the streets of Manila to incarceration at Fort Santiago and Bilibid Prison, criminal detention centers turned POW camps. US Army and Navy nurses (the “Angels of Bataan and Corregidor”) continued to work on Corregidor for several weeks, and were then sent to Santo Tomas. The rest were sent off in trains to various Japanese prison camps. General Wainwright was incarcerated in Manchuria. Over the course of the war, thousands were shipped to the Japanese home islands as slave labor. Some were eventually freed at the Raid at Cabanatuan and during the battle for Manila’s liberation. 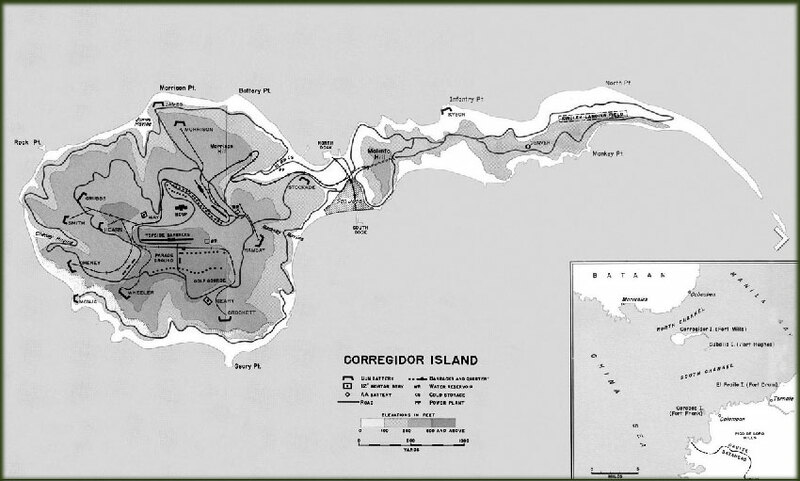 While most of the Allied forces on Corregidor surrendered, many individuals continued fighting as guerrillas. Corregidor War Prisoners Are Concentrated by the Sea. 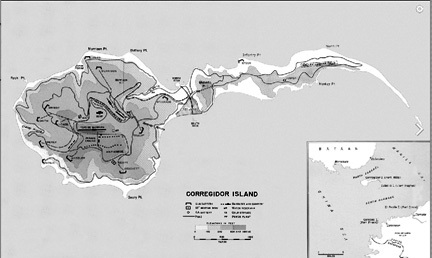 When General Wainwright acceded to the demands of the Imperial Japanese Army and agreed to unconditional surrender of Corregidor and, a short while later, of all the remaining United States forces in the Philippines, approximately 8,000 American soldiers, sailors and marines and 5,000 Filipino troops and civilians fell into enemy hands. All of these prisoners, with the exception of a few thousand injured or wounded who were lying in the Malinta Tunnel Hospital, were interned in an area on Corregidor known as the 92nd Garage Area. This was a level, concrete-floored area, possibly 500 feet wide and 1500 feet long, located between the beach and the cliffs inshore on the southern portion of Corregidor, facing Cavite Province. It was filled to overflowing with war prisoners. The only building in the area was a garage that had been rendered uninhabitable by reason of enemy bombing and shellfire. Officers and enlisted men alike were placed in groups of 1,000, with an American colonel in charge of each group. Each prisoner was given a number, which had to be painted on the back of his shirt or trousers. In the scant two days that elapsed between the actual capitulation at noon, 6 May 1942, and the internment of the prisoners in this area on 8 May, the Japanese soldiers robbed every prisoner of all his possessions, such as watches, fountain pens, rings, eye glasses, wallets and money. All the prisoners, officers and enlisted men alike, were required by Japanese order to salute Japanese soldiers and officers if they were covered, and to bow from the waist if they were uncovered. This rule was strictly enforced by the Japanese soldiers. The Filipino prisoners were kept separate from the Americans by an imaginary line. 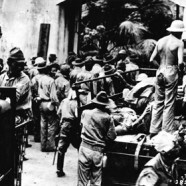 Within a few days after the surrender, the Japanese began calling on the American prisoners for large labor details for such purposes as cleaning up gun positions, completing the airfield, rebuilding roads, gathering ammunition, and loading the remaining food stocks on Japanese freighters for transport to Manila. 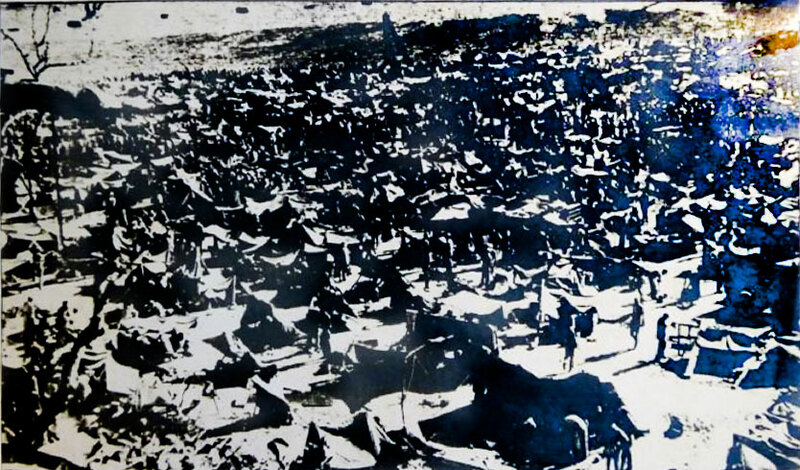 The prisoners joined together in small groups and, with the aid of a few shelter halves and other pieces of scrap material, made temporary shelters to protect themselves from the burning sun and tropical storms. For the first three days no food was issued to the prisoners, and many of them risked being shot by wandering outside of the area designated by the Japanese as a prison compound, in search of food and clothing. After three days the Japanese did issue a small allowance of rice for each man. The only additional food they had was canned goods which they were occasionally able to salvage or steal while out on work details for the Japanese. Many of the prisoners were severely beaten when they were caught taking any of these supplies, and were told by the Japanese that all such supplies now belonged to the Japanese Government. There was no water available for the first three days, but finally, after many entreaties from American officers, the Japanese permitted the Americans to install a ¼” pipe as a conduit from water reserves two miles distant from the area. The men had to stand in line from four to six hours each day to secure one canteen of water. The Japanese enclosed the area with hastily thrown up barbed wire fences and warned the Americans and Filipinos that anyone leaving this area without a Japanese guard would be treated as a criminal and shot. Sanitary facilities were extremely poor. Open latrines, dug in the middle of the area, drew swarms of flies and other disease-bearing insects. Nearly all of the prisoners suffered from dysentery during this period. A small dispensary was set up by captured American Naval medical officers and men. With the very limited supply of medicines and drugs at their disposal these men performed almost impossible feats during the following months in their efforts to keep alive the thousands who were suffering from prostration, dysentery, malaria and malnutrition. All of the patients in the Malinta Tunnel Hospital who were able to walk, were, by order of the Japanese in command, forced to leave the hospital and join their fellow prisoners in the 92nd area. On 24 May 1942 the prisoners of war who were interned in the 92nd Garage Area were evacuated from Corregidor and loaded into the holds of three vessels that were standing at the dock. They spent the night on board crowded in such a manner that it was impossible to stand or move about. On the morning of 25 May the transports pulled up anchor and sailed across Manila Bay to the shore opposite Pasay. There all the prisoners of war were made to embark into the Japanese landing barges, which then moved in toward the beach. When the barges had approached near the shore the prisoners were forced overboard in about four feet of water and obliged to make their way as best they could to shore, where they were assembled in columns of four. From this point they were marched to Bilibid Prison, a distance of about five miles, herded and kept in the line of march by mounted Japanese cavalrymen. Only in exceptional cases were any of the groups allowed a rest period during this march. Many Filipino people along the road of march tried to deliver food, candy and cigarettes to the prisoners, but each attempt was met with a slap or a beating at the hands of the Japanese guards. This march through the main streets of Manila was forced upon the prisoners of war from Corregidor in an attempt to show the Filipino people that the Japanese people were a superior race and the white men were inferior to them. The prisoners arrived in Bilibid during the afternoon of 25 May. There were now about 12,000 prisoners here, in a place designed to accommodate 4,000 at the most. Each day a large group of the prisoners was evacuated to Cabanatuan prison camp in northern Luzon, where they were later joined by the surviving Americans from Camp O’Donnell. There were several reasons for the bad treatment accorded to these prisoners. For one thing, there was the barrier of language. Very few Americans had any knowledge of the Japanese language, and as a result they frequently brought down punishment on their heads through unwitting and unintentional disobedience of orders that they did not understand. In other cases the treatment was due to the policy of indifference exercised by the local Japanese commander, and in many other instances, it was quite plainly a matter of revenge. Corregidor War Prisoners Are Concentrated by the Sea. Make shirt tents furnished shelter for all Fil-Amerian Prisoner on Corregidor – 9 May 1942.